The speaker talks about the path we’re on, where it’s headed, and what that really means for us. He paints a pretty dire picture…and it’s worth noting that this video is two years old. In that time, there’s been no action taken, and no science found to refute these conclusions…yet we remain mired in place, unable to embrace the science and take action. People are so incredibly focused on what fighting climate change would cost then, now, that they tend to overlook the cost of inaction. Sure, most of this cost will be borne by future generations, but what gives us the right to burden them with this? They deserve the same, or better, quality of life as us. So, what is the cost of climate impacts due to human-caused CO2 pollution? A recent study (link) finds the worst case cost, which is based on our current course of action, at about $1240 trillion, a number so large that I have a hard time comprehending it (the timeframe of this is a bit unclear, but they do say the annual impact is about $1.5 trillion so this cost looks like a long-term one, not to downplay its significance any!). What’s more important is that they also estimate that, if we can stabilize CO2 levels at 450ppm, the impact is only about $110 trillion, a substantial savings. Given the obvious cost savings here, and our current inaction, I fear our generation will do nothing more than teach future generations to not be so greedy. Which is not all bad, assuming future generations can manage to still have a cohesive, productive society in the changing ecosystem we’re creating for them. Read more here. 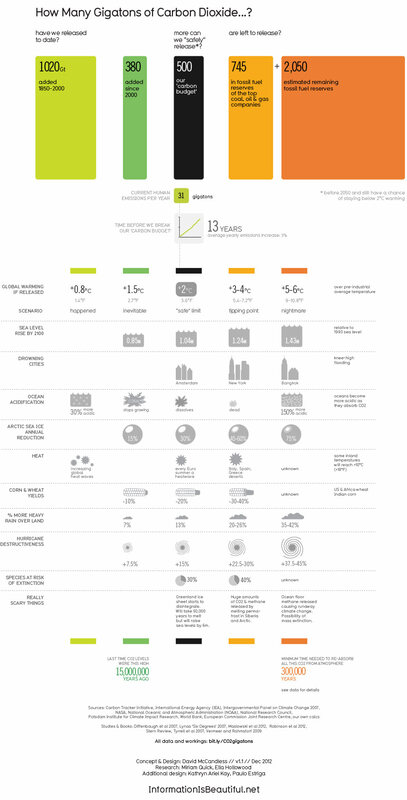 Jumping now to this infographic, obtained from grist. It lays out the expected impact of climate change, taking into account different CO2 emission scenarios (we’re on track for the worst case scenario as laid out here…scary). Click the thumbnail below for the full image.